Sunderland midfielder Grant Leadbitter has signed a new three-year deal at the Stadium of Light. The England under-21 international made 17 appearances in the top flight last season, despite picking up a series of injuries which halted his progress. The new deal means the 22-year-old is tied to the club until 2011 and admits agreeing terms was an easy decision. "I'm happy at the club and I want to help drive it forward next season, I want to kick on," he said. The combative midfielder shone in 2006/07 - boss Roy Keane's first season in charge - winning a Championship medal, and the Irishman was delighted to have secured Leadbitter's signature. "Grant's done a good job since I came to the club," Keane said. "He's got quality and he's enthusiastic - a good character. He's maturing well." 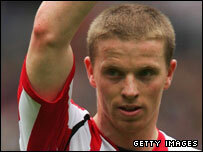 Leadbitter is now Sunderland's longest-serving player after making his debut in September 2003. He has made 93 appearances for the Black Cats, scoring nine goals.